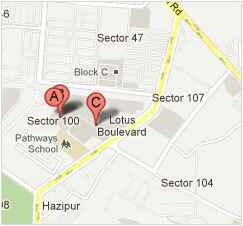 The 3C Company presents LOTUS BOULEVARD- India's Largest Green Residential Estate. Srategically located in Sector 100, Noida, Lotus Boulevard enjoys direct accessibility from the expressway and is situated close to the already habitant sectors - 46 & 47. Nestled amidst 40 acres of tranquil and solace, Lotus Boulevard heralds an era of new world luxuries combining with suburban living. The 'Green' features and benefits of this unique residential estate, take it much beyond any other project.